I admit it -- I'm an Appalachian Trail hiker. It's been in my bones since 1957 when I took my first hike and determined to hike the entire trail. The AT is my first love and I see all other trails in comparison to it. So what follows is an account of hiking across Scotland on the 212 mile Southern Upland Way, then a climb of Ben Nevis, Britain's highest mountain, (both accompanied by several of my students) then a 100 mile solo walk back from Ben Nevis to Glasglo on the West Highland Way alone as compared to hiking the Appalachian Trail. If you are interested in hiking in Scotland, and know anything about hiking the Eastern Appalachians then the following observations may help as you plan your own trip. Scotland's trails are easier than the AT, thus you can count on half again as many miles as the AT, maybe even twice the miles if you are a low mileage AT hiker. The Southern Upland Way's route through Galloway is boggy (like the month of May in Maine) but beyond that, the trail is something like walking on a lawn, though there are plenty of high hills to climb. The West Highland Way is higher in the North, but the trail is so heavily used that is akin to the Smoky Mountains trail, though with less elevation gains and losses. The most difficult footway on the WestHighland way is the old "Military Road" where cobblestones the size of baseballs beat your feet for several days. But even there you can often find a parallel dirt path beside the cobblestones. But don't let the easier pathway mislead you into thinking Scotland isn't a beautiful place to hike. It is absolutely stunning. Do it! Brits don't camp much but choose rather to sleep in a B&B or hotel, rise late, eat a giant English breakfast and begin hiking at 9:00 AM with a tiny day pack on their back including a lunch made by the B&B host, arriving at the next B&B in late afternoon, clean up, change into their evening clothing and visit the pub for dinner and an evening out. Not everybody does the B&B styple walking, but I'd guess 80% of the hikers on both trails used this method of hiking. Many were astounded to discover we were "camping." On the other hand, there is hardly any competition for campsites. You can camp most anywhere, and if you ask permission form land owners they almost always will say yes. Of course, if you carry a bivy you can easily "take an overnight break" most anywhere without even being seen. I prefer sleeping on top of the marvelous hills the trail crosses. There are umpteen million sheep in Scotland (even more in Wales). Nobody actually eats them, but they do produce fine wool for sweaters and Harris Tweed coats. But the agricultural subsidy is generous enough that one wonders if the subsidy is the real crop, and wool and meat are merely by products. The first few thousand sheep are delightful to see. You get tired of them eventually. In lambing season (late April & early May) some parts of the trail have "diversions" you must take to avoid giving the not-so-smart sheep conniptions. All hikers must learn to close gates behind them, but 90% of the fence crossings have fence stiles anyway. It is easy to find, but almost always fouled by the by another by product of the zillion sheep upstream. Many local hikers carry city water from their B&Bs. We treated water with one drop of household bleach per liter of water. But it was not a pleasant drinking experience. Especially after our Kool Aide ran out. It was, however, exciting to watch the little swimming squiggly things slowly die and fall to the bottom of the water bottle in the 20 minute waiting period. Scotland is almost always cloudy. The sun is often not seen for several days, making it all that much more beautiful when it does come out. Gentle rain can be expected for short periods many days, but seldom is it enough for full rain gear while hiking. In May the temps are often in the 40's F which, when accompanied by the hefty winds, can be pretty chilly. The tops of hills are so windy that if it is drizzling it feels like you are facing hed on into a Shower massage. Remember the quote "In Scotland if the rain is coming down it's good weather"... it is the sideways rain that kills you. Both trails visit a town about every day or two. Resupplying is easy, but don't count on getting much information from the printed guides they could take a lesson from "Wingfoot." Camping out is not the average way people do these trails, so there is scant information on food. And even when they tell you there is a food shop, it may be a post office with two shelves of groceries including canned goods under the counter. Nevertheless, a hiker can get new supplies every day or so, and since pubs are easier to find than groceries we (increasingly) bolstered our supplies with such lunches. Don't count on getting Kool Aide or minute rice in Scotland, but mostly everything else is available. Groceries about the same as the US, perhaps a tiny bit more. So is everything else. Public campsites run about $15 -- $18 per day but there are few of them. There are a few Hostels on the route at about $15-$20 per person. B&B's are everywhere at about $20-$25 per person but they are often reserved in advance by Brit-Hikers. There are a half dozen or so "bothys," (which are the equivalent of the AT Shelters except they are closed structures, and thus sometimes even dirtier) which are free and open to all, though the Scots hide their locations to outsiders printing a secret code on the maps which you have to figure out to find them. (You can figure it out... keep trying!) Only occasionally are Bothys they on the trail or do they have a sign. Brit maps are great -- we have much to learn here. Most use a 1:25,000 scale... meaning that five miles of trail eats up a foot of map! I never felt like I was hiking so fast! The maps have every building, Roman ruin, ancient site, and even include every carin at the top of mountains. (The topographically-challenged Keystone Trail Conference in Pennsylvania should see these!) Indeed, Brits carry their maps in plastic cases around their necks on a string like an unaccompanied child on a airline flight. Most AT walkers (who often spurn all maps and "just follow the blazes"), will think the Brits look corney. However see the next entry to understand why. 9. Point to point hiking. Many Europeans are point-to-point hikers, rather than feeling an obligation to follow the exact trail. AT hikers would call them "blue blazers" or even "Yellow blazers." Europeans like to find a better route than the official trail, and thus their compass and map enables them to decide, "I think I'll go down that valley and over this mountain into Bargrennan, instead of following the trail." Americans say, "I hiked the whole Southern Upland Way." Europeans say, "I walked across Scotland." What woods? Where? 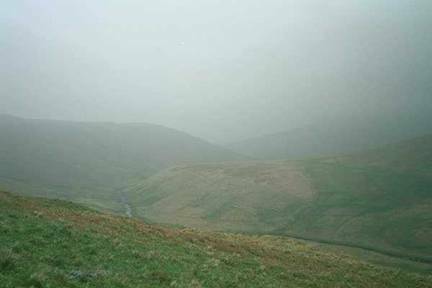 Most of Scotland is bare providing impresive panoramic views. Remember the "Big Bald" areas in North Carolina? That's Scotland's SUW. There are increasing acres of woodlands, but they are planted in perfect rows like a crop of corn, and usually a single species of trees and so they are so boring that you'll join the Scots and complaining when the trail goes through them. Once you see one of these open hills shrouded in fog and clouds you'll understand why every "hill walker" carries a compass and map. It's use a compass or crawl in your bivy and wait till it clears. As an AT walker you might be wondering why one wouldn't simply follow the blazes in the fog or clouds? Simple. There aren't any. The only place to paint blazes is the grass. So the trail is marked periodically with 3"X 3" posts. These are adequate when there is no fog, but it can get hairy in the fog. Generally the posts are placed at a decision point. That is, you just keep heading the same direction until you come to the next post. (Generally speaking, that is, but you can't take it to the bank!) If you are on a "forest track" (i.e. "wood road") look for a post at every crossroad or crosstrail. The trail markers don't shout -- they gently whisper. In that sence they are very European -- where everything is understated. Scots like Americans and enjoy talking with you. We experienced "trail magic" almost every other day including everything from a lady who let us sleep in her yard and use her shower, to a 80 year old postmistress who served us giant pots of tea and a trayfuls of delicious home made cookies. However very few Scots actually hike their own trail. 80-90% of the hikers were English, Dutch, or German, and a few Americans. The way everybody hikes the SUW is west to east... to keep the wind at your back (no small factor -- I turned around once to test it for a few hundred yards) plus a West to east trek keeps the sun out of your eyes (The west to east route heads a bit northeast.) I did the SUW the "right" way. I did the WHW wrong. 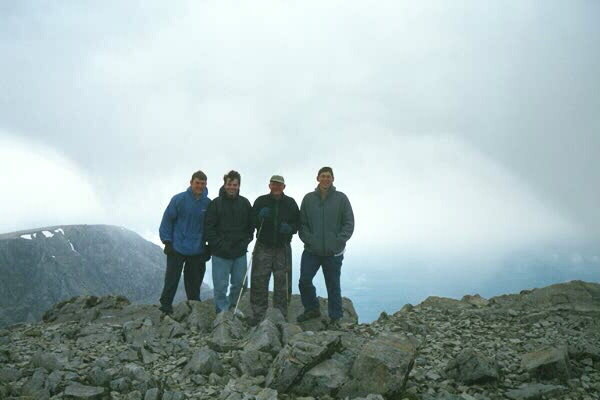 Everybody hikes it south to north ending up near BenNevis, making the trail get higher and more remote as you go. I was walking back to the airport though. Compared to the AT it is crowded. But Europeans don't think so. The SUW had a dozen or so people a day on a busy day. The WHW however, had about 50-70 per day. You decide if this is a "crowd" -- I considered it packed. Perhaps this is why the European hikers carry map and compass and strike out on their own route at times? In May and June you can hike in Scotland until about 10:00 PM and can start again by 4:30 AM. Basically you simply can't hike all the available hours of light and get enough sleep. This is really takes the pressure off. And since you are not in the forest most of the time, you can even hike after dark sometimes for it is twilight until about midnight. Not much for an AT walker, but if you keep your eyes keen you can see an occasional fox, and more often a red deer or row deer. Birds are not as plentiful as Americans are used to. In May you are OK. By June they start coming out. By July they can drive a normal person insane. Midges are Scottish mosquitoes, but they aren't mosquitoes really, but more like Pennsylvania no-see-ems with their own blood drills. Suffice it to say they are misrable. I came upon a man in his fifties on the West Highland way beaten by the midges. (Midges are worst around Loch Lamond) The man was sitting along the trail sobbing -- I am not making this up -- actually sobbing -- when I stumbled upon him. Thinking he was injured I stopped and offered help. Turning his face toward mine with tears streaming down his cheeks, he showed me his arms and face swollen and bloodied by midges (and by his scratching) and said, "I'm ruined,... I'm ruined... and I even ran marathons... now I'm ruined...I have to quit." There will be no midges in Heaven, but they certainly will inhabit eternity in the other location I am sure. If so, it is certainly one of the best reasons to go to heaven when one dies! 18. Questions they ask at home. Ever get frustrated with the questions the uninitiated ask you -- people whose idea of backpacking is going car camping and sitting in a screened-in enclousure reading the latest mystery novel? Questions like, "I bet you'll be reading lots of books?" Or, "I suppose you'll be doing a lot of writing, right?" On our trip we fashioned an answer: "Backpacking is like this: Take a standard marathon and divide the miles in half to make it easier. Then to make it harder, instead of covering the miles on a road or track, make the route over rocks and through swamps. Now, adjust the marathon from level ground to trails over hills and mountains -- about three or four per day of about 1500' climbs each. Then to increase the difficulty add a 25-30 pound pack to the back of each participant. Finally, do one of these ten hour each day half marathons-with-pack-over-mountains every day for several weeks, and you will have a general impression of what we are doing -- and of how much reading or writing books fits into such a day." A delightful starting point near impressive cliffs. We arrived by Taxi from Straanraar at 10 PM in a steady rain and slept a mile down the trail on top of the cliffs the first night. Nice store. Good phone. The castle has an entrance fee meaning it is not worth it, but the park-like area surrounding Castle Kennedy is pleasant. Don't drink the water from the pond. Don't even swim in it. Knowe services except a phone booth. Great steak pie at the pub. Great church too (where they invite hikers to stay after the Sunday service for fifteen free cups of tea and ten thousand cookies.) Campsite with a smattering of food -- enough for a few days of "no-cook snacks" at least. Check their freezer too. The scenery switches now from bog to walking along a river and high mountains as if you've entered another state on the AT. Loch Trool has a campground and hot showers for $15 US and plenty of groceries at the camp store. I forgot the name but its only a half day from Loch Troll and it had a wonderful view. On a clear day I would have considered it grungy. On a rainy day it was a castle. A pretty place for a break if the water level is up. Desolate if not. Don't drink the water flowing in under the road. A nice forest walk in to town -- one of the best multi-species forest. Great bridge too, and a good church. Several stores here for groceries -- the best yet, and even a gas station to supply your stove. About 15-18 miles out of Dalry there's another bothy -- this one right on the trail/forest track... maybe about 7 miles or so before Sanquhr as I remember it (hey, don't hold me too accountable -- I'm a lightweight packer and thus toss my maps as soon as I finish that section... this is from my journal -- which, as a lightweight hiker are written on AitGrams and sent home at each crossroads). The bothy was decent but not great -- they had filled in the fireplace with concrete which was a good idea, but stubborn people kept trying to build a fire in it anyway so the bothy was so smoke permeated that laying my bandanna on the table overnight invested the smoke smell into it which lasted several more days. A bigger town with anything you need. Plenty of B&B's here, but no bunkhouse or youth hostels. The two students I traveled with charmed the lady at the info center so much that she called a friend of hers who let us sleep in her back yard and use her shower. She even did our wash for us all the ehile putting up with her husband's rude/lewd comments on her work. A delightful youth hostel here at about $10 US -- don't miss it -- white house up on the hill. Also if you believe in admission-fee-attractions you can take a lead mine tour. The graveyard will remind you that living to 35 was a ripe old age for many lead minors. There's a good resupply at the post office (the highest post office in Britain). You are getting close to half way now... at 99 miles from the start. Get a rest here -- you've got some real climbing ahead of you starting tomorrow -- up toward those giant golf balls across the valley. About 4-5 miles before Beatock. Oh well, what can you say... in the rain it is good enough. But I figure if I'm gonna sleep inside I might as well be staying in B&B's and having it really good... face it -- a bothy is just a cheap-dirty-ugly B&B without the second "B." In the rain (which is often in Scotland) it was fine. You are now 119 miles from Portpatrick with 93 to go -- you're well over half way now. Beatock has nothing but a classy hotel-pub (where we ordered several sandwitches per person, the British sandwiches being so dainty). So then we walked to Moffett, which is a sort of tourist town full of gigantic air conditioned "coaches" spewing out often-obnoxious English "pensioners" to buy stuff they don't need which their children can sort through and toss out when they die. Old people are delightful in singles and couples. Why do they get so obnoxious in large flocks? (Maybe its true of all ages?) Moffett is a big town with everything you want (except that you have to pay for the public toilets). Down the hill there's a great old graveyard to slip in and rest. Moffett has lots of places to eat a "fish tea" of full dinner if you can afford it. 15. My favorie Secluded Upland Spot. The walk after Beatock is astonishingly beautiful. My favorite place in Scotland was a half day East of Beatock/Moffett. I wrote in my diary the following: This is the most astounding spot I've seen in Scotland so far. I am perched on the side of a steep slope with a wraparound vista. To my left I see the trail winding down off the saddle where it follows a tiny creek through swampy grasslands where one hops hummock to hummock to keep your feet out of the muck which comes over your socks -- I know, I came up that way and missed a few hummocks. Just below to my left is an ancient stone sheepfold -- a circle with one low door across which the shepherd slept (perhaps saying under his breath "I am the door?") I am surrounded above by three high peaks, half covered with heather with their tops protruding out in rock which even the stubborn Heather can't cling to. In front and below me running laterally is a deep gorge carved so sharply in the mountains that one could not walk down the slope. I can hear the faint rushing of the water through this gorge. To my right the water drops over a tidy falls, white and frothy. Once the water passes me it turns away cutting a deep knife-edge-in-reverse canyon through the high mountains across from me falling away and disappearing to the unseen valley beyond. The grandeur of the whole place reminds me of Chimney pond on Mt. Katahdin. What a wonderful place! As if to charge you for the grandeur the next section makes the hiker walk on lots of roads which are punctuated only with several rewarding swimming holes. Good pub with meals and they even let you read their paper. They also let you camp here if you want to. Not much but a phone, but a great (to Appalachian Trail Hikers) NEW bothy two miles past -- log cabin style without a fireplace thus clean (Water source is, of course, kept secret... up trail to first road, then left down road to several damp spots). The trail from St. Mary's loch to Traquair was pretty tiring for me -- perhaps it was the trail, or maybe me. Three houses and a phone booth -- but the phone only works for the 999 emergency calls. Keep hiking. Largest town on the SUW -- everything you need (except Koolaide to mask the taste of the sheep-dip water) and Instant rice (what they call "American quick rice, isn't either). Leaving town you walk through the neighboring Melrose which also has everything. A half days walk from Galashiels. Upon arrival you are now only 32 miles from the sea. Good supplies here, and a great bunkhouse (attached to a B&B) run by Susan Henderson with cooking stove in garage. Don't miss sleeping out on top of this... in the night you'll see a light from the lighthouse on the distant sea where you'll end soon (tomorrow? ), and, if the morning is clear, you'll see the shining sea. A phone, but not much else, no supplies, and an in-the-home post office. Down the road a piece you can have a great meal if you've got enough money. Click here to return to Keith Drury's Writings listing.